GDS conducts Service Standard Assessments for public-facing services with more than 100,000 transactions per year. All smaller services are assessed internally by departments. As the expertise within departments has grown, we’ve started asking designers and user researchers from departments to sit on the GDS panels as well. The trial has been very successful, with the departmental assessors bringing new points of view to the process. Katy Arnold, Head of User Research and Design at Home Office talks about her experience for us. Recently I joined a GDS service assessment panel for the first time. I’ve been through a couple as a user researcher, and sat on numerous panels for our internal assessments with Home Office Digital, but this was the first time I took a seat on the other side of the fence at a GDS assessment proper. It was the first time that anyone outside of GDS had been part of an assessment panel - and I was a little nervous. But the experienced hands - Ed Horsford and Martyn Inglis guided us through it. It’s hard to apply rigour and not become all schoolmasterly but they really nailed it. The assessment is important and they took it incredibly seriously but they kept the atmosphere as open and frank as possible. I often veered into empathy and had to restrain my desire to make the team being assessed feel okay but in the end it was an extremely professional affair and I learnt a lot. 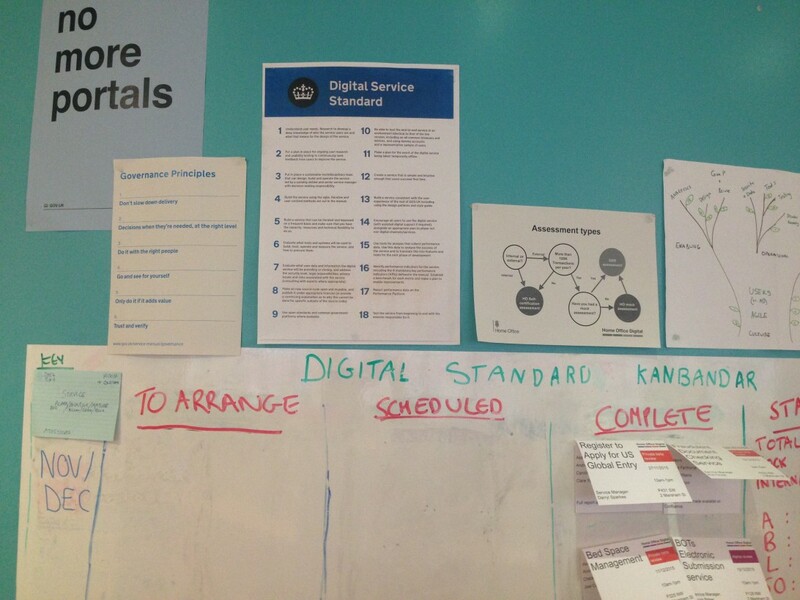 At Home Office Digital we are immensely grateful to the assessment process - and the service standard - it's probably the single most important thing to have happened to digital delivery here. And it’s hard, really hard. Unless you approach it the right way. I was chatting online to Bernard Tyers recently, he’s one of our researchers who is currently observing users in Kuwait use our Beta Electronic Visa Waiver service for real. We’re putting small numbers of people through the service in a private beta before we open it out to higher volumes. It means we can sense-check how everything is working whilst keeping the impact of any potential problems to a minimum. It’s a fantastic way of seeing how we’ve done so far and finding the things we’ve missed. The team back in London are already filling their backlog with new stories to work on in the coming weeks. I talked with Bernard about how, when his service came to assessment, he didn’t have to spend days or weeks preparing. All he had to do was talk about the great work he’s been doing. Your work should stand for itself. Get those things right and the assessment should be a formality. It’s still extremely tough - you need to be able to explain and defend your work. That’s always a challenge to do in front of an audience. But if you’ve been doing the right things, it should be relatively straightforward and you should not need to prep. The rigour of an assessment drives us all to a high standard. It’s the reason any of us are even here and it’s why government is applying user centred design to service delivery. And when it needs to be, it’s been a clear focus for all of us on the most important thing in all of this. It's our users, citizens of the UK, who deserve our attention. Thanks to the service assessment we are starting to open doors, change minds, and build better things. Things which make more sense for those who use them. There are huge challenges in assessing government services but I’m right behind it. Follow Katy on Twitter, and don't forget to sign up for email alerts. Hi Katy, great blog. I was having a discussion with a colleague earlier today about this topic and I'm curious if GDS plan on having a pre-requisite for potential assessors to have embedded experience working for an agency in service delivery? It would definitely help broaden their understanding of the challenges some agencies face. Hi Dan, sorry for the delayed response. The service standard team say that having experience of delivering services is required to become part of the panel (along with being a trained self-cert assessor who has previously been part of assessment panel within the department). There's also a pre-requisite for potential assessors like Katy (ie from departments) to have experience in delivering services. We're doing this because they have better understanding of challenges; as we expand the pilot and have more 'non-GDS' people on panels this will grow. Hope this helps.